Maxta has announced the launch of its MxSP, the first Cisco-certified hyper-converged system to run on UCS C-Series servers and support metro-distance clusters. But how can a storage software company supply a hyperconverged server/storage/networking/software system when all it does is create the storage software component? Maxta claims its “software-defined storage solutions provide organisations the choice to deploy hyper-convergence on any x86 server, use any hypervisor, and any combination of storage devices". Um, marketing alert, marketing alert. What Maxta seems to be saying is that customers (aka organisations) can deploy virtualised X86-based servers and attach any storage devices to them to create a hyperconverged system. Instead of a hyperconverged system being a single IT appliance-like entity bought with a single SKU, as with Nutanix and Simplivity (OmniStack) boxes, it’s now the result off an on-site integration exercise resulting in a scale-out cluster of software/server/storage/networking nodes. Earlier this year, Simplivity, whose own appliances use Dell servers, said it could provide its OmniStack Integrated system with Cisco’ UCS C-Series servers instead, with the system providing the hypervisor, compute, storage, network switching, backup, replication, cloud gateway, caching, WAN optimisation, real-time deduplication and more. Simplivity’s channel partners would integrate the UCS kit, including Nexus 3048 switches, with the rest of the components, using a reference architecture (registration required) and deliver a single-SKU system to customers. This is effectively what Maxta is doing, but adding it’s certified by Cisco, which Simplivity did not. The MaxDeploy reference architecture specifies 4 x UCS C240 M3 rackmount servers, each with 2-socket, 4-core Xeon 2600 CPUs, 12 x 1TB, 7.2K SATA disk drives, 2 x Intel 300GB DC S3700 SSDs, and a 10Gig E port for networking, plus VMware vSphere and vCenter. 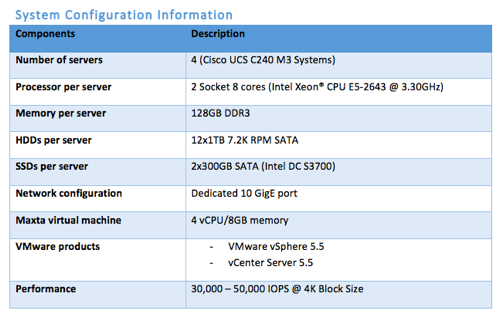 MaxDeploy UCS reference architecture system spec. No networking switch is included but VMware vSphere Metro Storage Cluster is supported, providing the ability to replicate data across data centres and so provide protection against data centre failure.